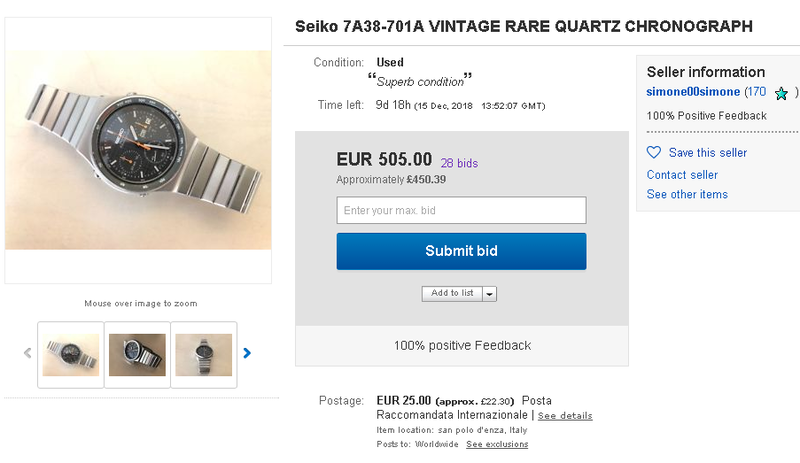 By the time that 7-day listing ended, the Italian eBay seller simone00simone had already reduced their 'pie-in-the-sky' Buy-it-Now price to 550 Euros. 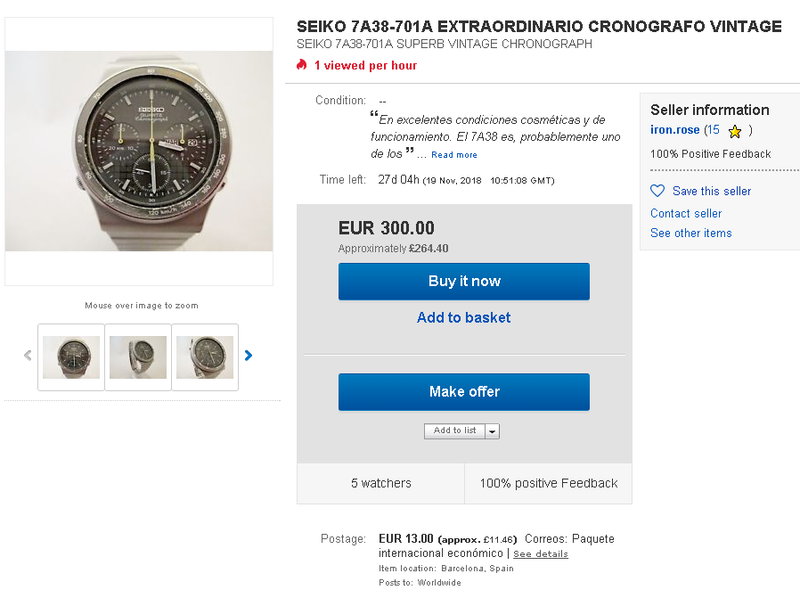 They re-listed it soon afterwards with a Buy-it-Now price of 500 Euros and subsequently reduced that again to 450 Euros, resulting in a sale yesterday evening. 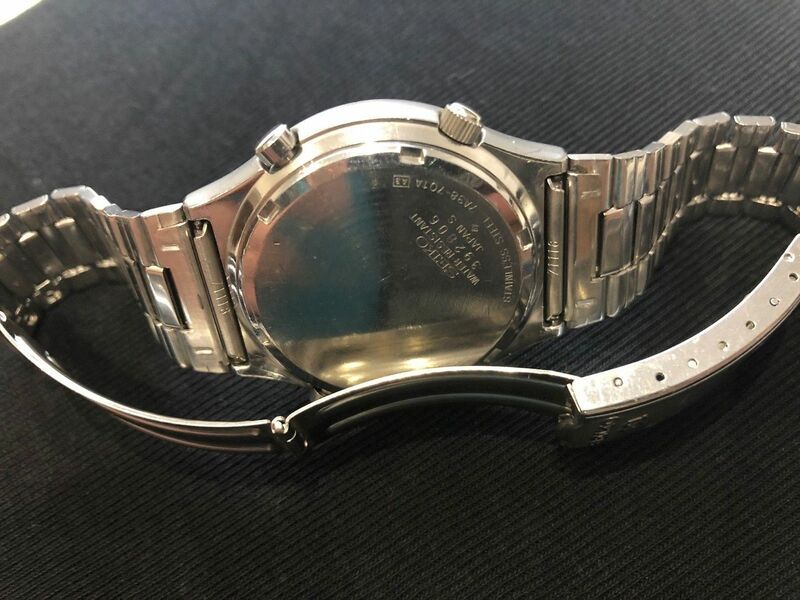 That's still a heckuva lot of money to pay for a watch fitted with the wrong bracelet. 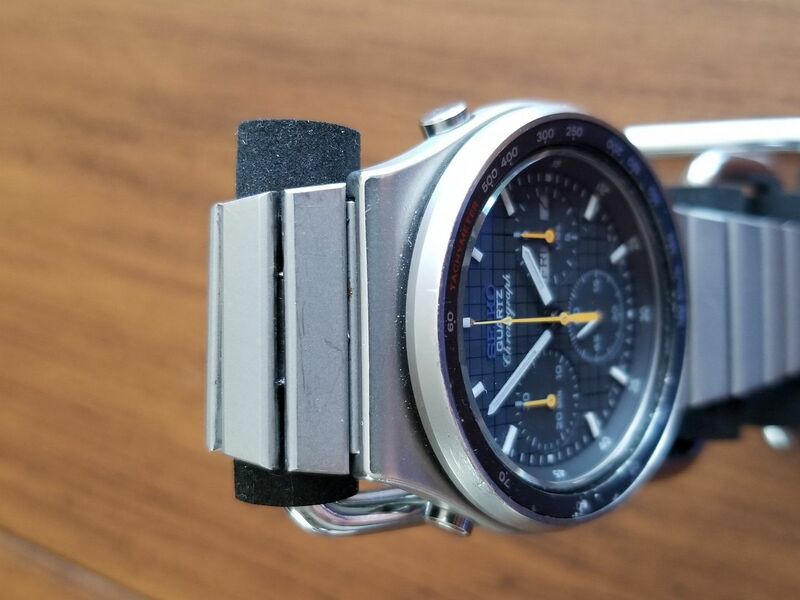 That well-worn 7A38-701A fitted with an ill-matched Hirsch leather strap by the US eBay re-seller sold this afternoon, for his reduced Buy-it-Now price of $319.99. There had been no other lower offers made (I checked WatchCount.com). All it ever takes is one. 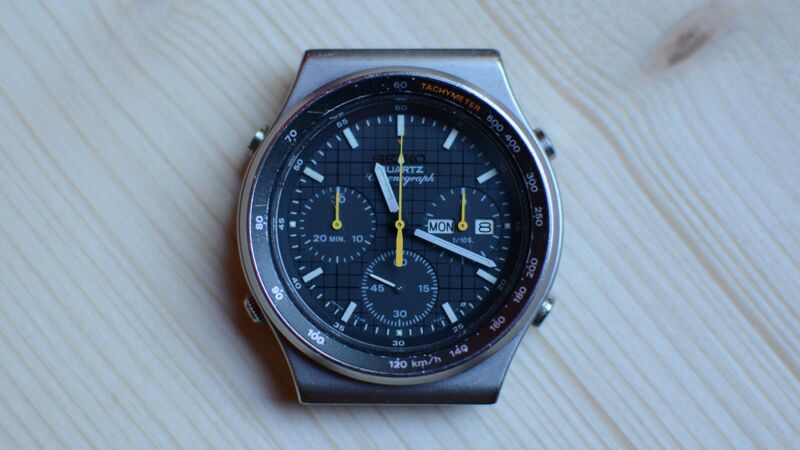 This 7A38-701A in average worn condition, with typically faded chronograph hands, (now pale yellow instead of their original orange) and wabi'd bezel inlay, was listed yesterday morning by a Spanish eBay seller, with an over-optimistic Buy-it-Now price of 420 Euros. En excelentes condiciones cosméticas y de funcionamiento. 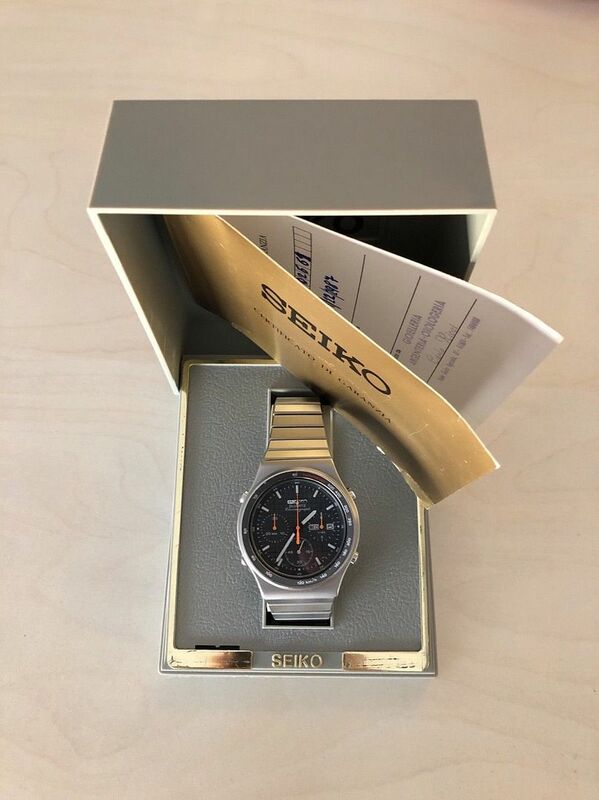 El 7A38 es, probablemente uno de los cronos más buscados de Seiko siendo de los primeros cronos analógicos de Seiko y, probablemente, el mejor crono jamás hecho por esta firma. In excellent cosmetic and working conditions. 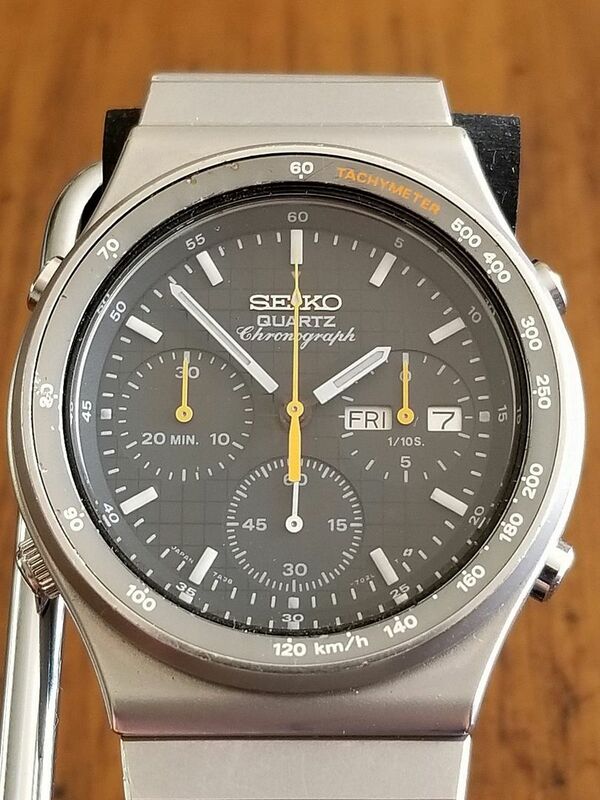 The 7A38 is probably one of the most seeked Seiko chronographs as they are one of the first analog Seiko chronograph and, probably, the finest one ever made by this brand. See detailed information below. Photos are part of the description. SERIALES: 304742 7A38-701A en tapa trasera. Japan 7A38-702L T en esfera. 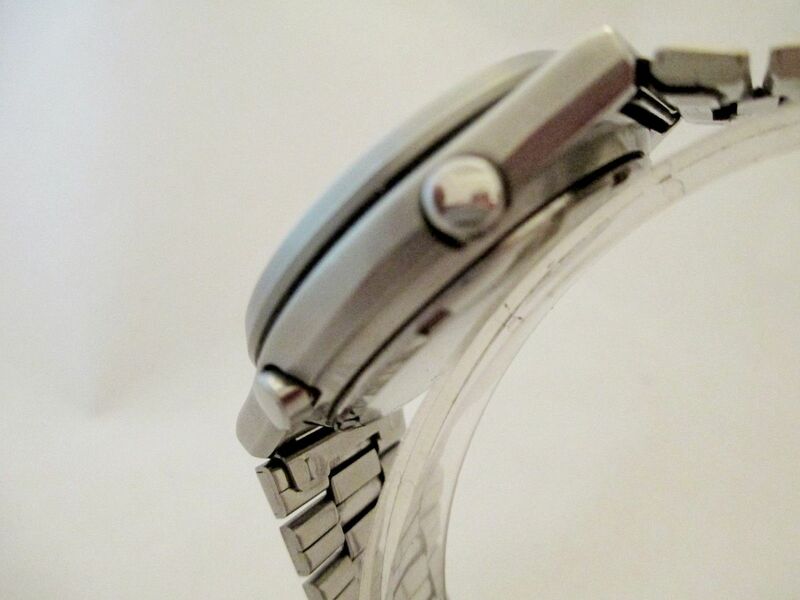 INSCRIPCIONES: Water Resistant Stainless Steel en tapa trasera..
MECANISMO: Cuarzo. FUNCIONANDO. Dia y fecha cambian con la corona y con las manecillas. Todas las funciones crono están Ok.
ESTANQUEIDAD: Water resistant. No comprobado. DIA/FECHA: Fecha y dia en inglés y español. CAJA/BISEL: Acero inoxidable. En excelentes condiciones casi sin señales de uso. El bisel está algo difuminado y con muchos raspones pequeños. MEDIDAS CAJA (ancho/alto/prof. en mm): 39x43x11 (sin contar la corona ni las asas). ESFERA: Cuadricula negra sobre fondo gris oscuro. Numerales y manecillas en blanco o amarillo. En perfectas condiciones. CRISTAL: Mineral. En excelentes condiciones con un par de raspones solo visibles desde un ángulo. CORREA: Acero inoxidable. 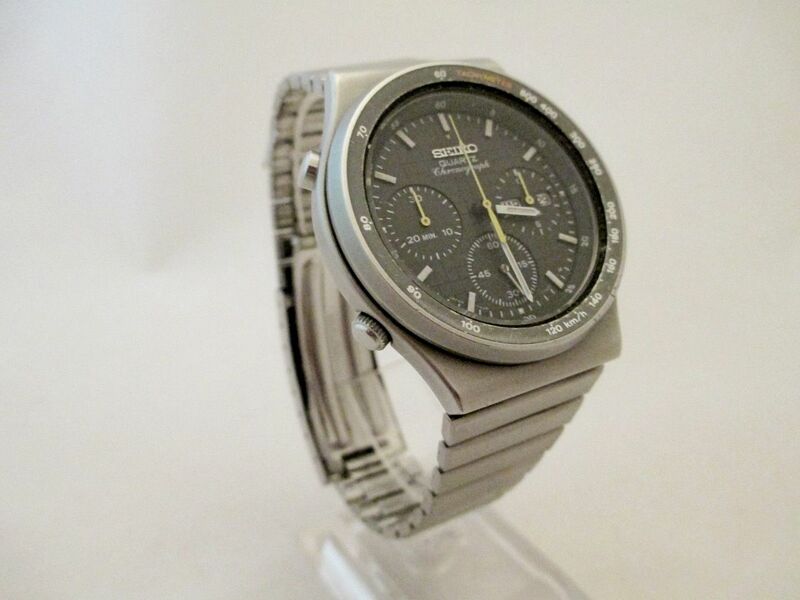 Legítima Seiko Quartz y original de este modelo. En excelentes condiciones casi sin señales de uso. PESO TOTAL CON CORREA: 81 grs. Sólo se aceptan pagos por PAYPAL y los mismos deben ser realizados dentro de los tres dias posteriores a la venta. En caso de ser un objeto usado con varias décadas de existencia no puedo garantizar la duración de su funcionamiento, más allá del momento de ser enviado. Por las mismas razones, este artículo puede tener reparaciones y tener recambios originales o no. Sólo se enviará el artículo una vez recibido el pago. Los envíos se realizan EXCLUSIVAMENTE por Correos de España como carta certificada nacional o Paquete Azul o carta certificada internacional o paquete económico internacional. En todos los casos existe una TARIFA PLANA, tanto para los envíos nacionales como internacionales, diferente según sea un caso u otro. Los gastos de aduana o importación serán pagados por el comprador. Se enviará el artículo protegido en una caja apropiada. NO COMPRES SI NO ESTÁS DE ACUERDO CON ESTAS CONDICIONES!!! 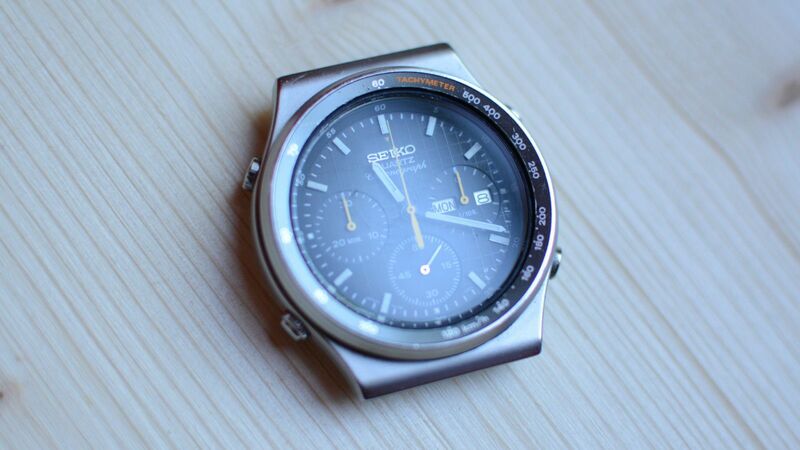 LEGENDS: Water Resistant Stainless Steel in case back. MOVEMENT: Quartz. WORKING. 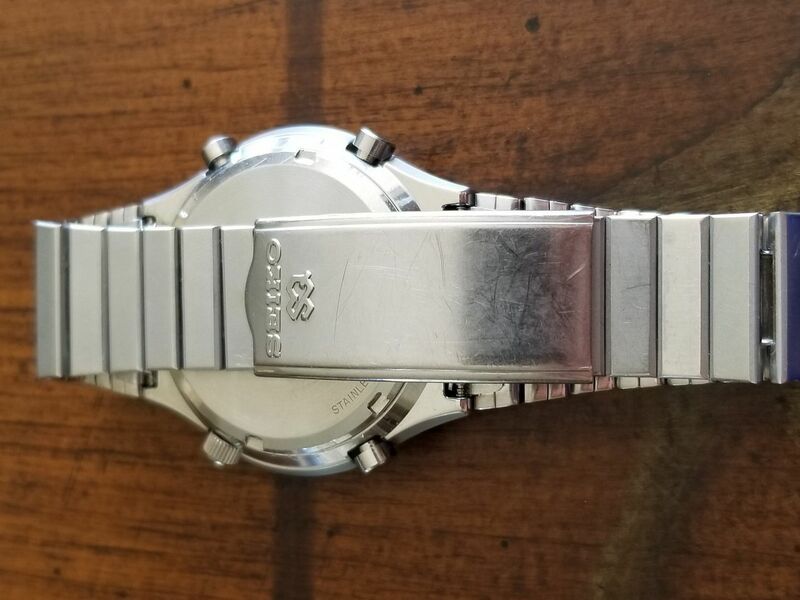 Day and date change with crown and with hands. 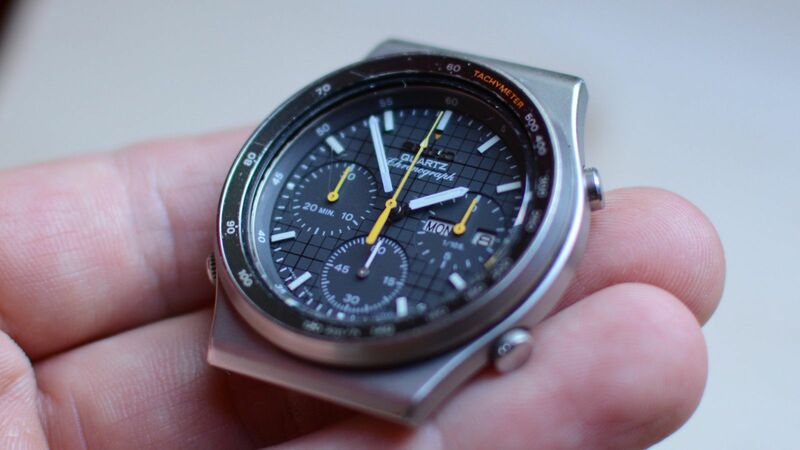 All chronograph functions working as they should. WATERTIGHTNESS: Water resistant. Not tested. DAY/DATE: Date and day in Spanish and English. 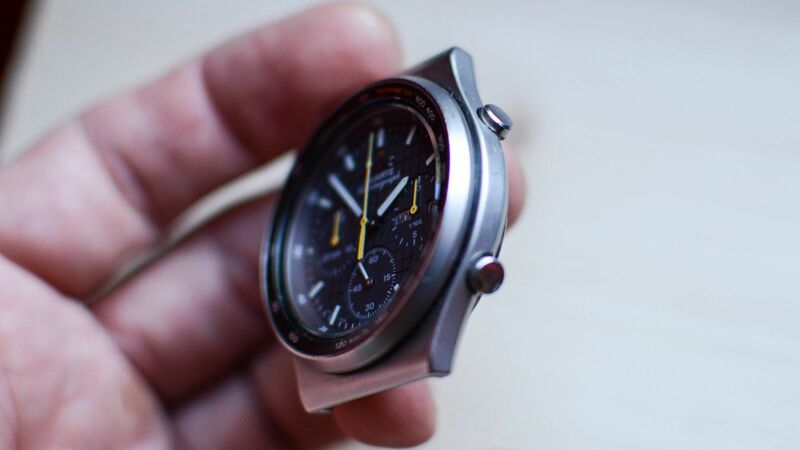 CASE/BEZEL: Stainless steel. In excellent conditions with few signs of use. 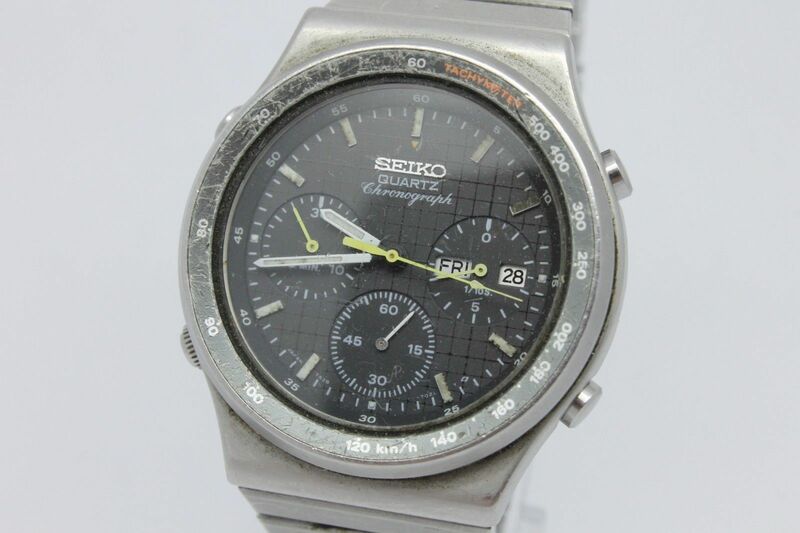 Bezel is lightly discolored and has many tiny scratches. CASE SIZE (width/height/deep. in mm): 39x43x11 (with no lugs or crown). 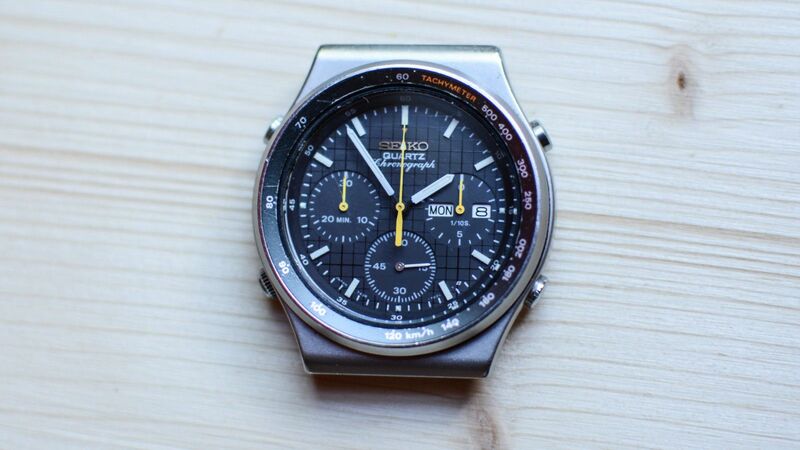 DIAL: Black grid over dark grey background. Numerals and hands in white or yellow. In pristine conditions. CRYSTAL: Mineral. 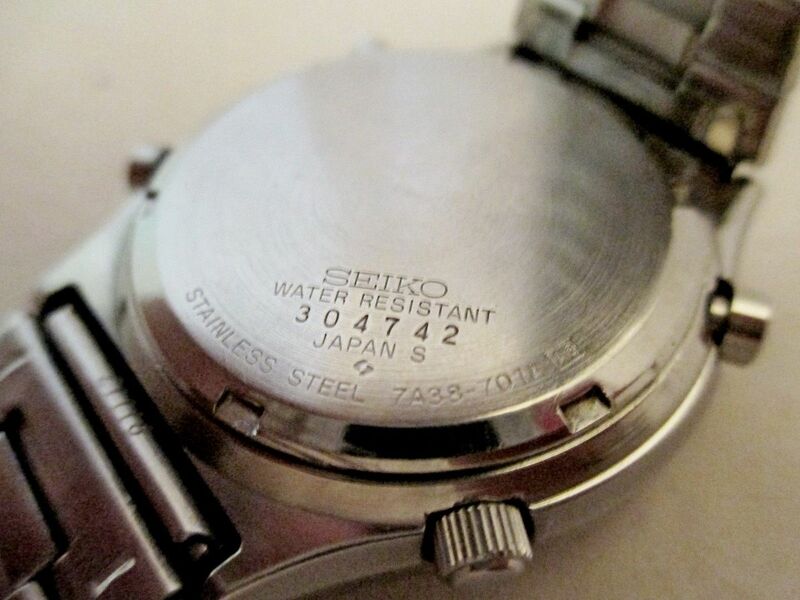 In excellent conditions with a pair of scratches only seen looking the watch at an angle. 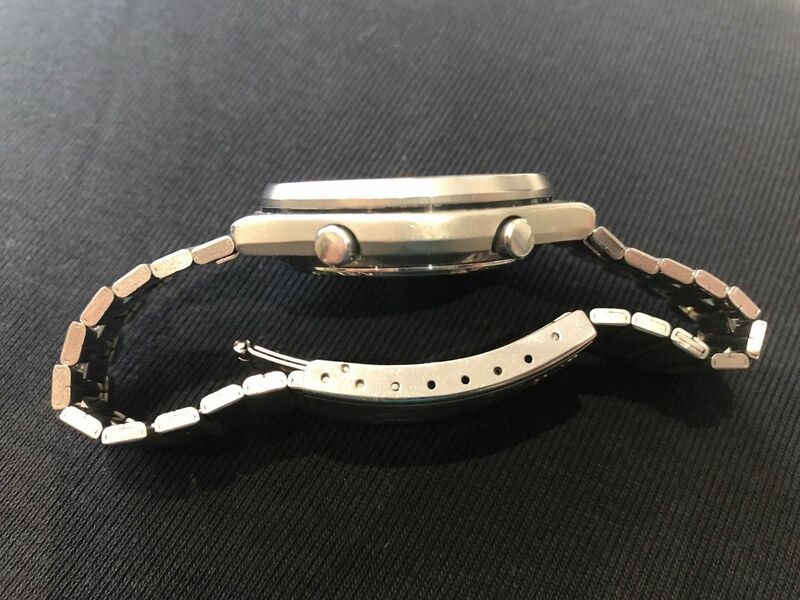 BRACELET: Stainless steel. 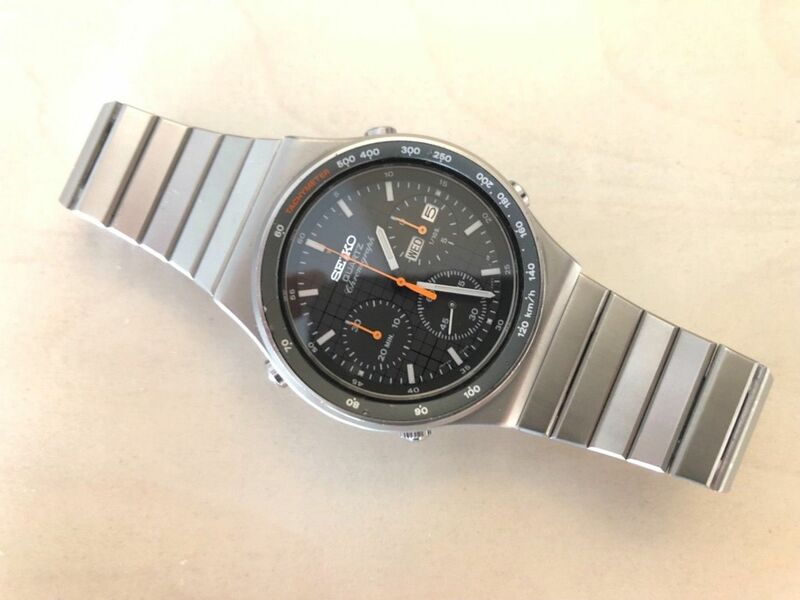 Genuine bracelet of this Seiko model. In excellent conditions with almost no signs of use. 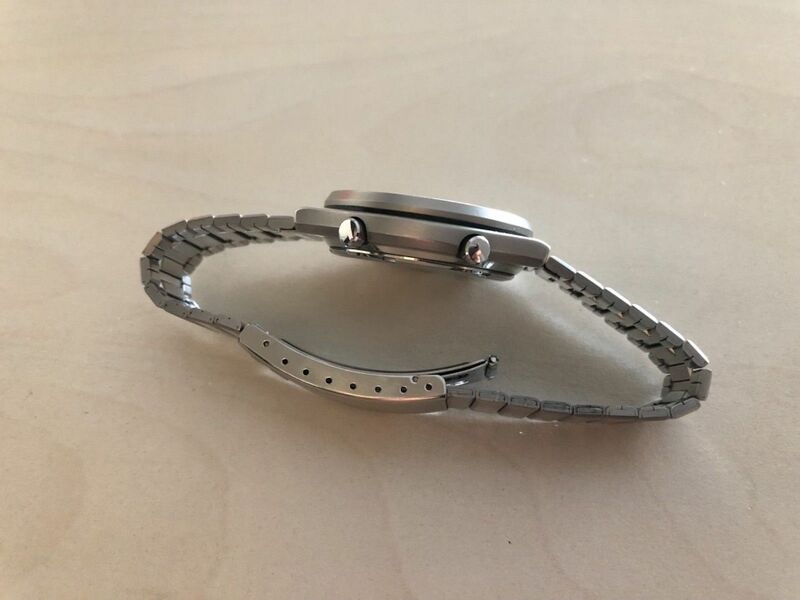 TOTAL WEIGHT WITH BRACELET: 81 grs. Only Paypal payments are accepted.. The payment must be made within three days after the item is bought. No returns or refunds are accepted. 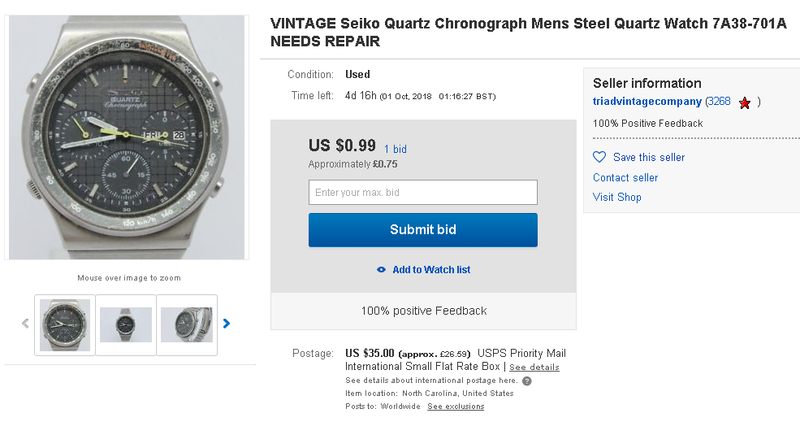 In case of being a used item many decades old, its working condition cannot be guaranteed beyond the moment of been shipped to the buyer. 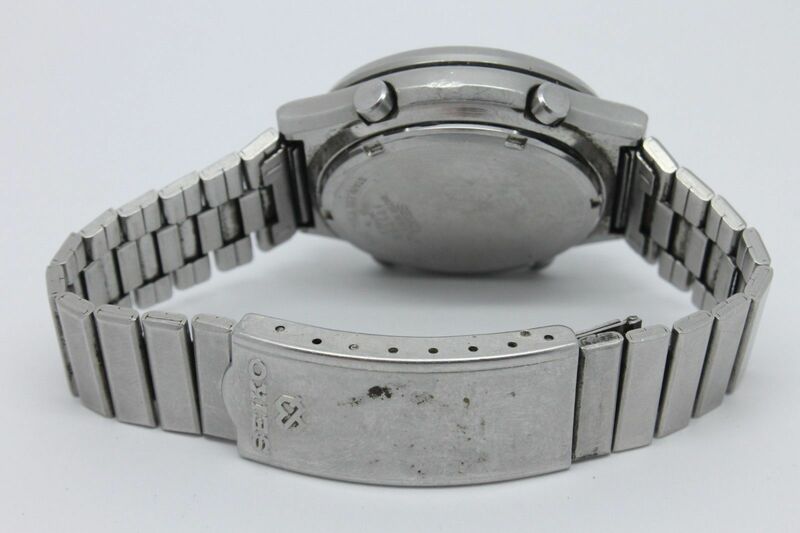 For the same reason this kind of items may have been repaired and may have used genuine or not aftermarket replacements. The item will only be shipped once the payment is cleared. Shipment is EXCLUSIVELY made through Spanish Postal System (Correos de España) as domestic registered letter or package or international signed letter or package and with a FLAT RATE for all Spanish territory or another FLAT RATE for all other countries. Custom charges will be paid by the buyer. The item will be properly packaged and protected within a box. DON'T BUY IF YOU DON'T AGREE WITH THESE TERMS!!! Earlier today forum member and occasional poster here, Michael Creech a.k.a. 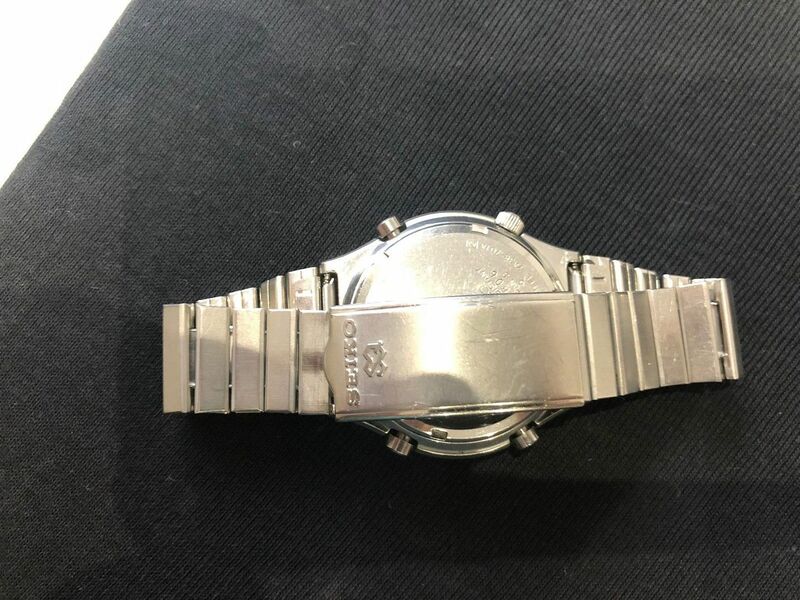 'SeaCreechur' advertised his 7A38-701A for sale on SCWF Trading Post with an asking price of $595. 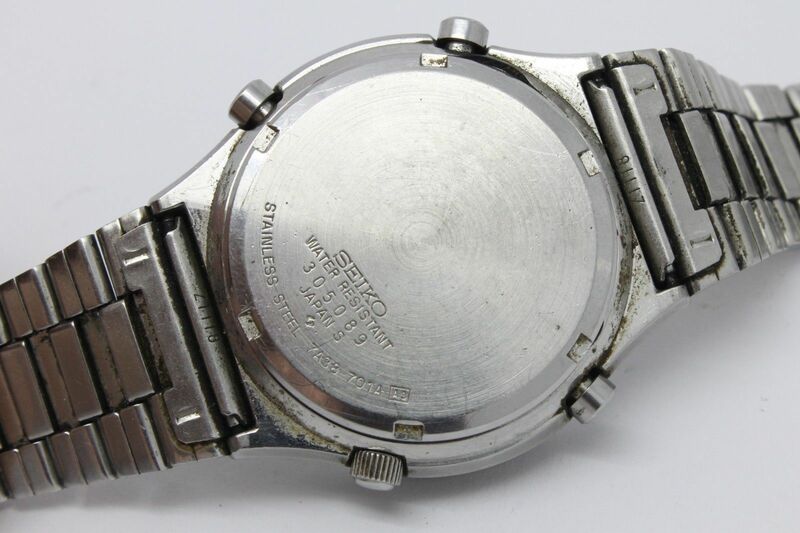 No surprise that this particular 7A38-701A, case-back serial number 3O3069 has featured earlier in this thread - you'll find it towards the bottom of page 3. 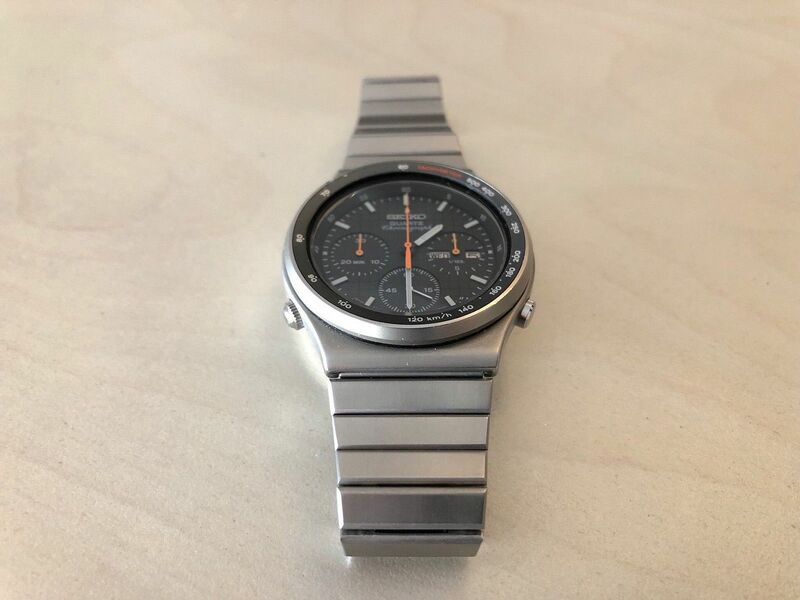 Michael bought it from an Italian eBay seller in March 2017 for 285.54 Euros. Sorry, Michael. Gotta be said. He bought it from Italy (the country with the most notoriously unreliable postal service in Europe). 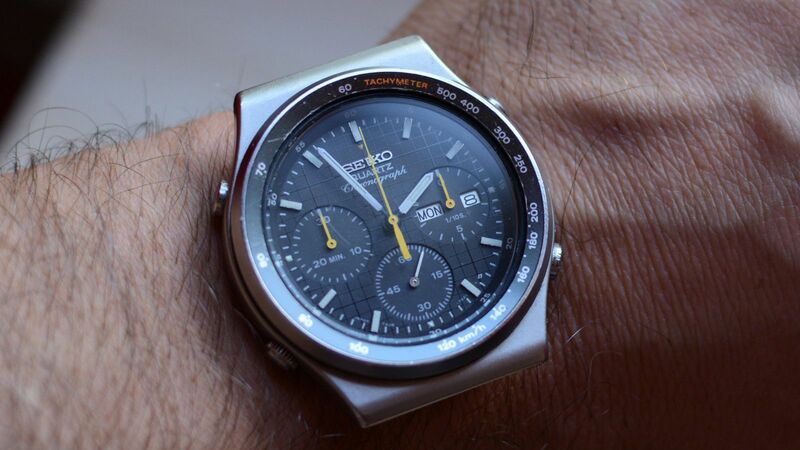 He's posted it to Simon in England to have it serviced, but now won't ship (sell) it outside CONUS. 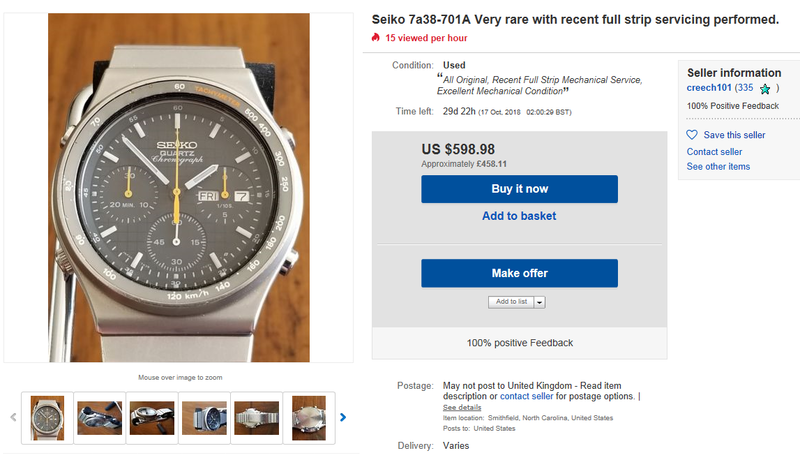 Having advertised his 7A38-701A on SCWF's Trading Post, for just over a week, without success (despite a bump and reduction to $555), in the early hours of this morning Michael listed it on eBay, with a Buy-it-Now price of $598.98, or the option to make an offer. 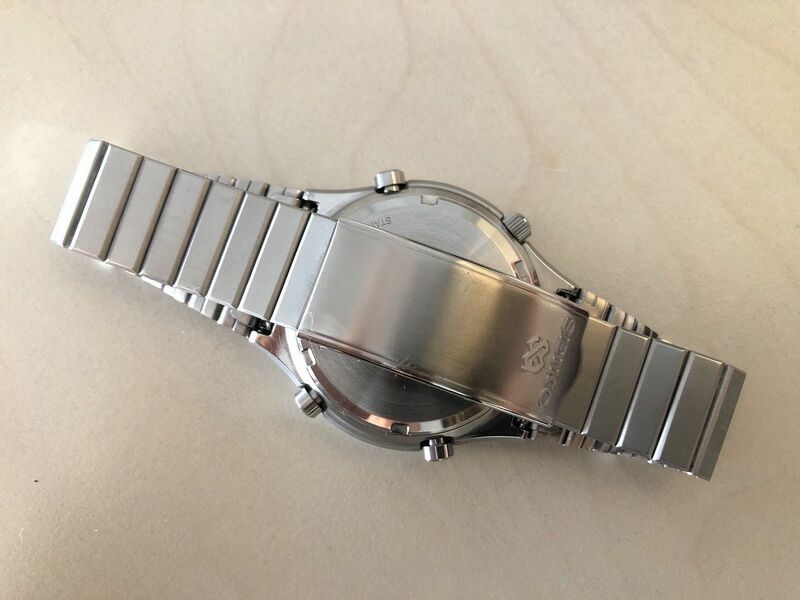 The listing photos are the same as he used in his SCWF advert, except that the primary image is now correctly oriented - plus there's an extra one of the case-back (and a rather pointless shot of the underside of the clasp Z-fold which I can't be bothered to upload). 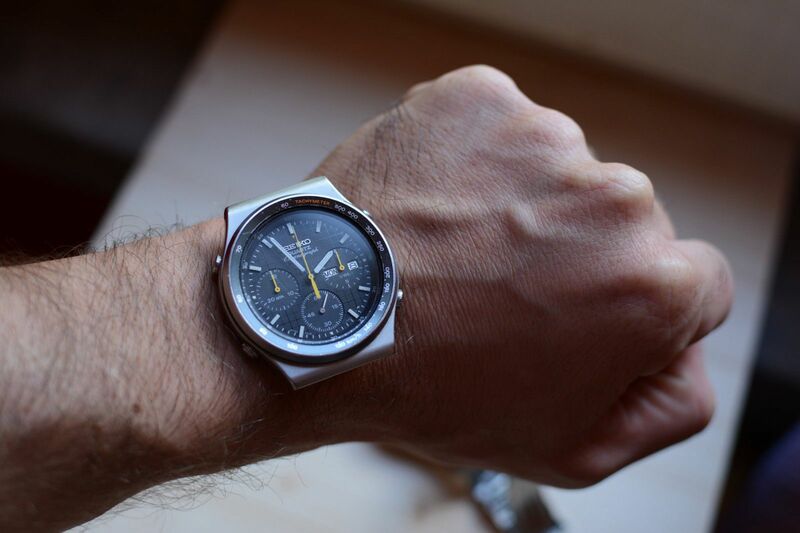 Still no international shipping - CONUS only. 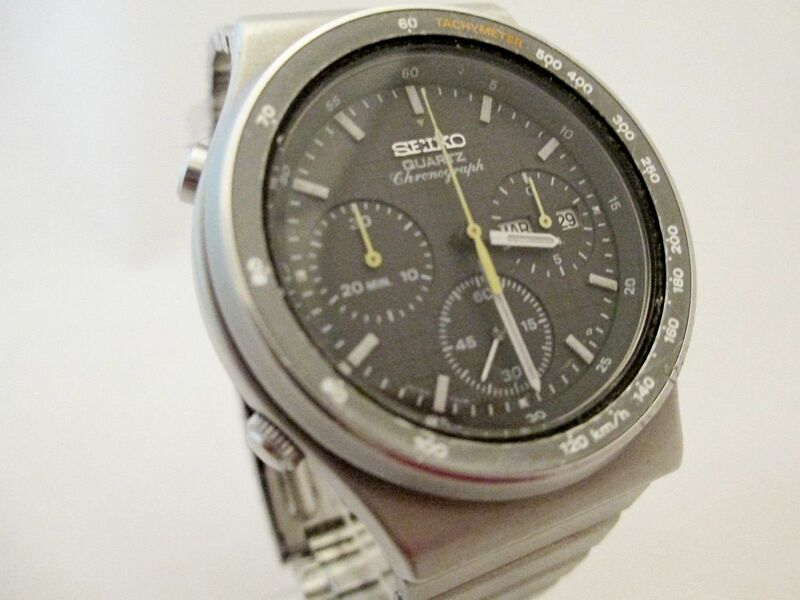 Selling a very rare, all original, serviced, vintage Seiko 7a38-701a quartz chronograph from my personal collection. 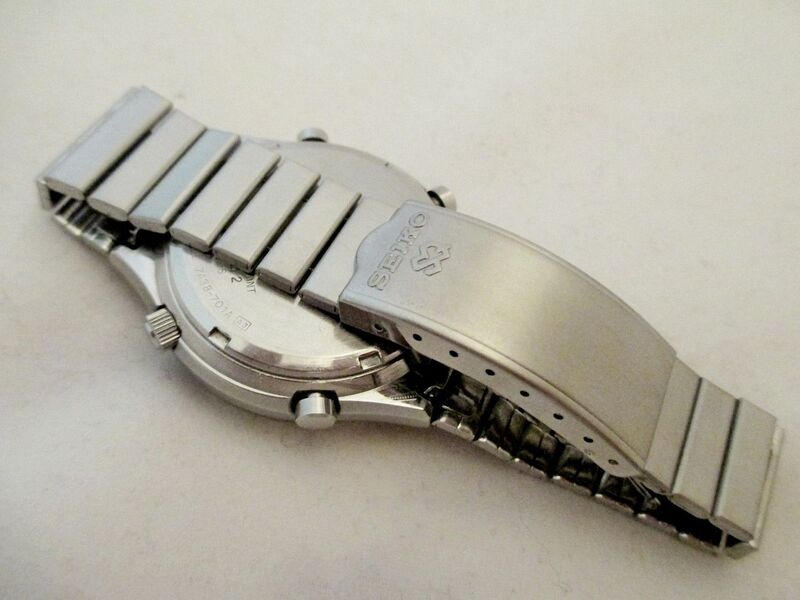 This watch had a full strip-mechanical servicing recently by Simon-Siralan from the Wrist Sushi watch forum. Servicing details that I received from Simon are available upon request. 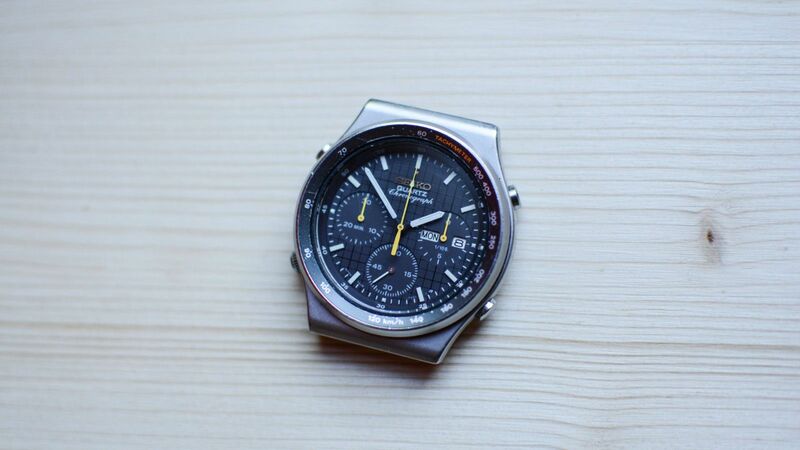 The watch is in excellent mechanical condition and all pushers perform flawlessly. 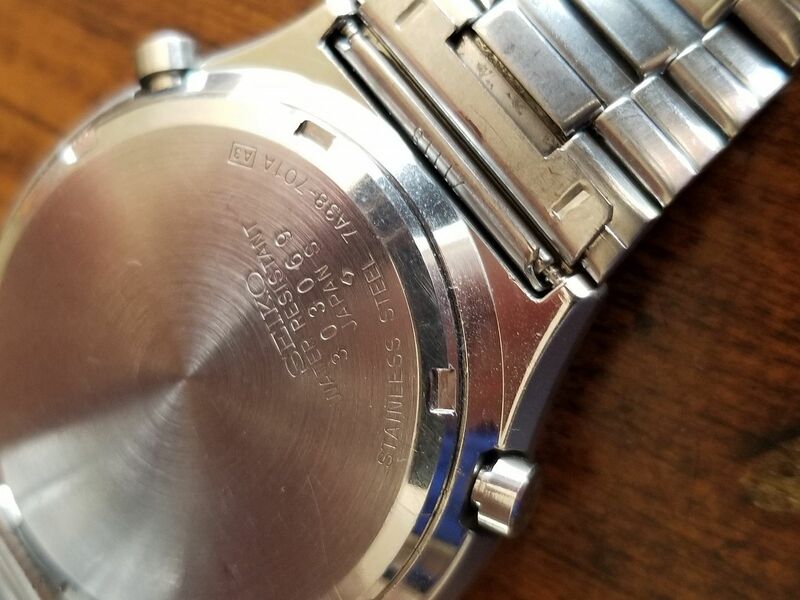 The watch bezel and bracelet both have minor scratches typical for a watch of this age. 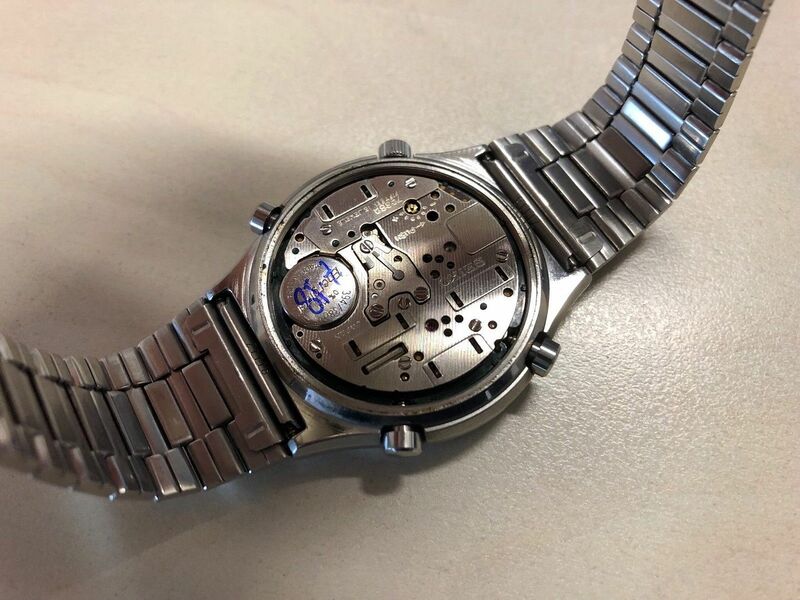 I do not guarantee this watch to be waterproof even though all new gaskets were installed during servicing. No returns. No international shipping. Free shipping CONUS. Bid with confidence. 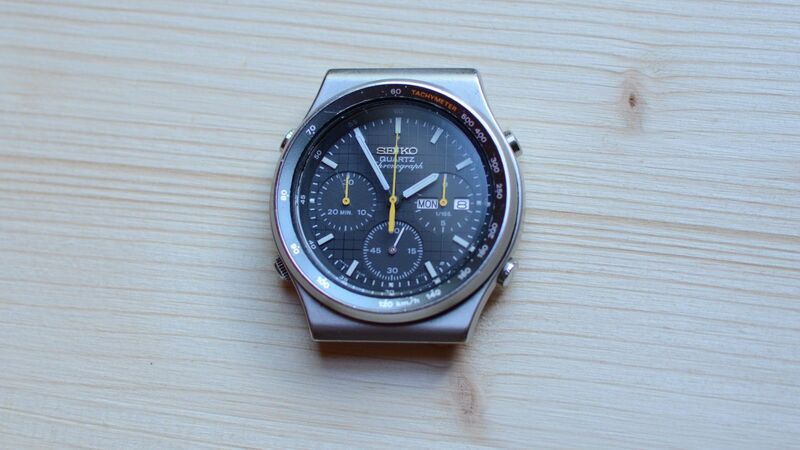 Check my feedback rating on my prior Seiko vintage watch sales. 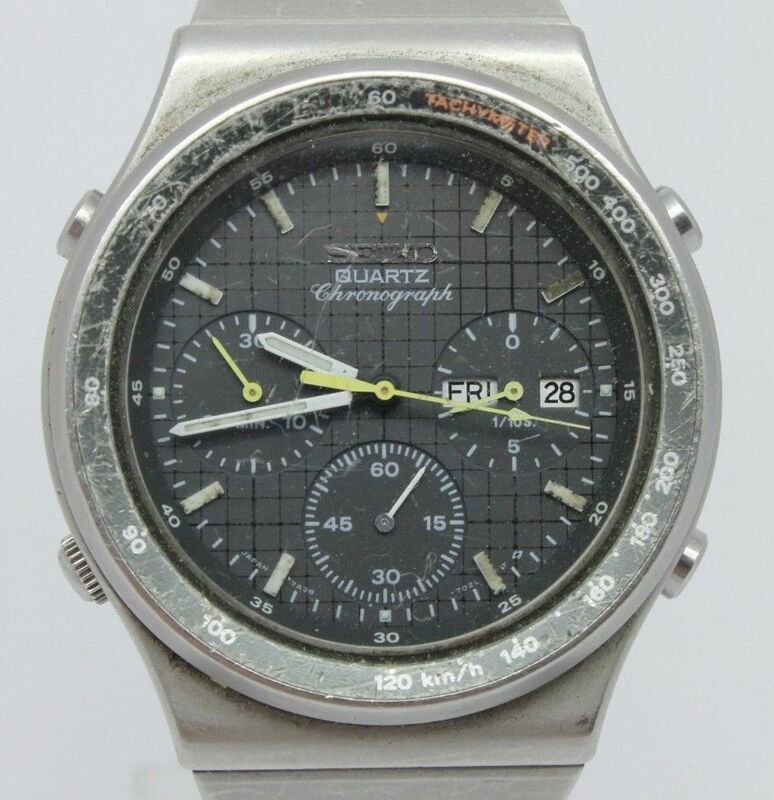 Please check my other vintage watch listings. I did send Paul an email, from the front page under contact us, that did stipulate that I would ship internationally to any member of this forum... based upon his recommendation. That said member would be responsible for shipping costs, ins, VAT and that I would not be responsible for any Customs issues. Somehow he failed to disclose that information... or I failed to see it, when he posted my EBAY listing. 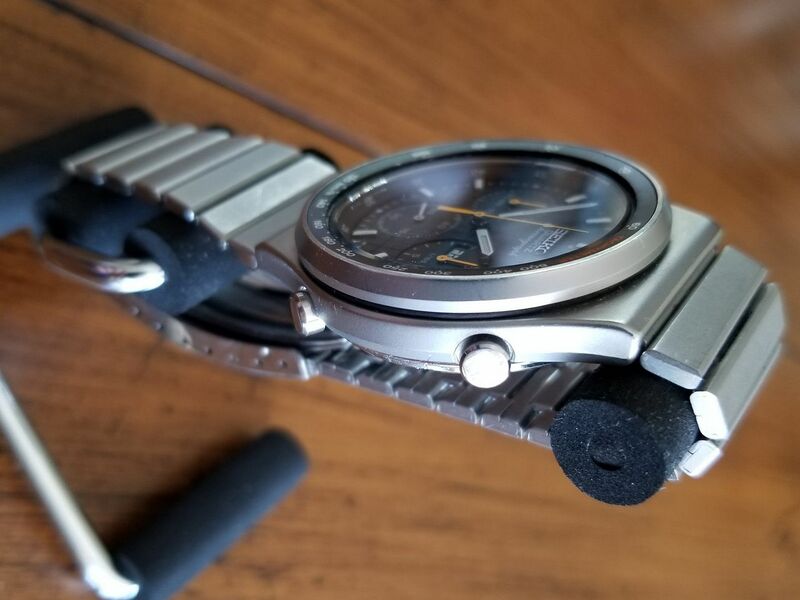 I also stated in a prior email to Paul that I would do the same for this same listing that I have posted on SCWF and Wrist Sushi. Paul...please feel free to share those two emails to your members...or at the minimum, acknowlege that you did receive them. You can amend your comment that I will ship to any known member that you personally will recommend. I did state no international shipping but I would ship to any of your members here, based upon your recommendation. I have absolutely no intention of providing you with a free vetting service. 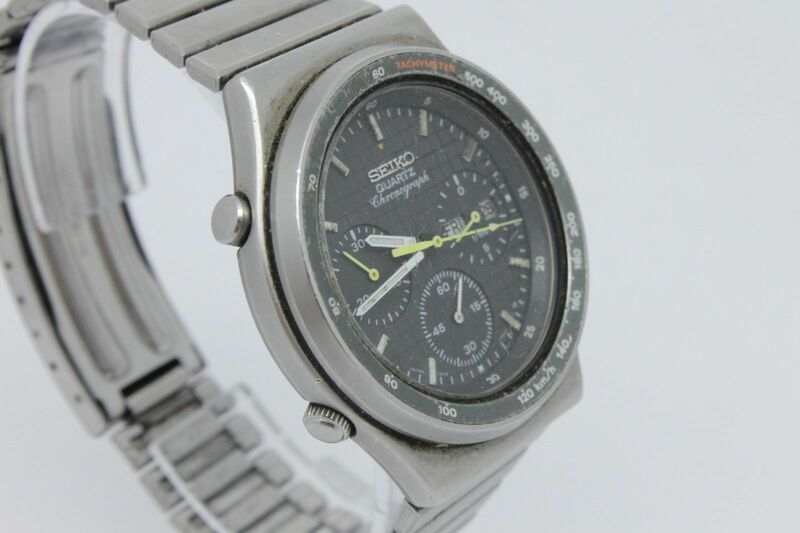 This non-running 7A38-701A in well worn condition, was listed in the early hours of this morning, by a US eBay seller, as a 5-day auction with an opening bid price of $0.99. 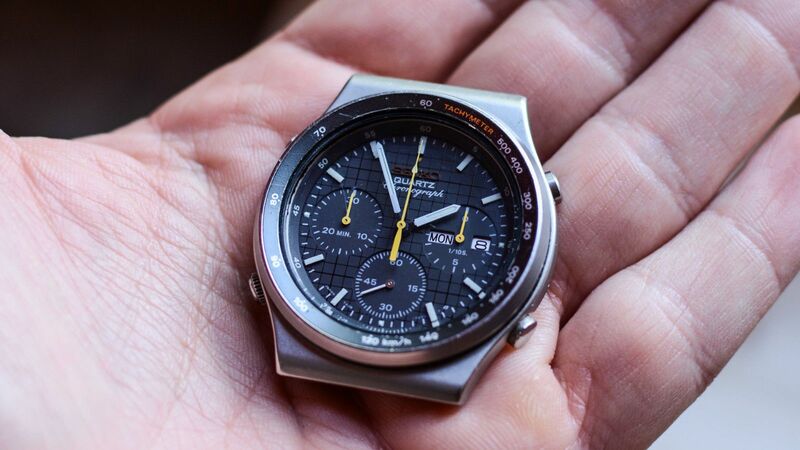 I must say, it makes a refreshing change, to see a watch in such condition, so honestly described. 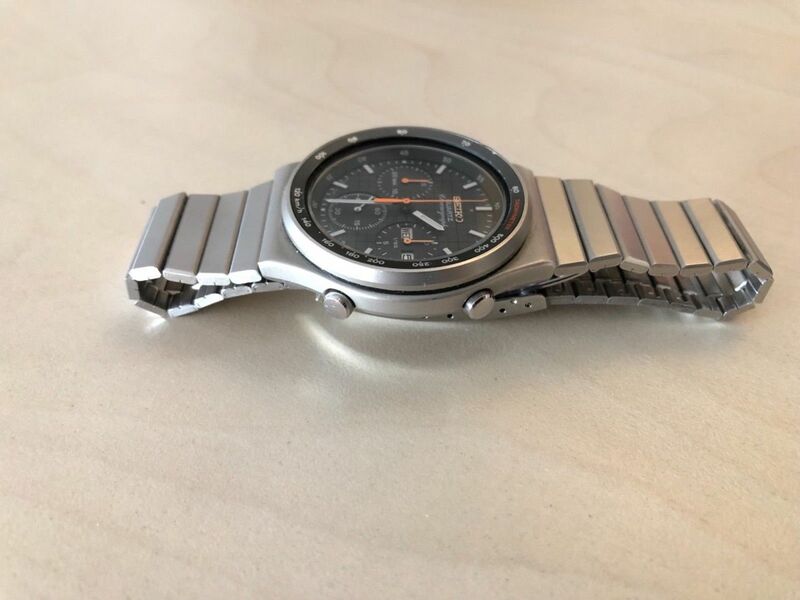 The watch is currently NOT working. A new battery did nothing. 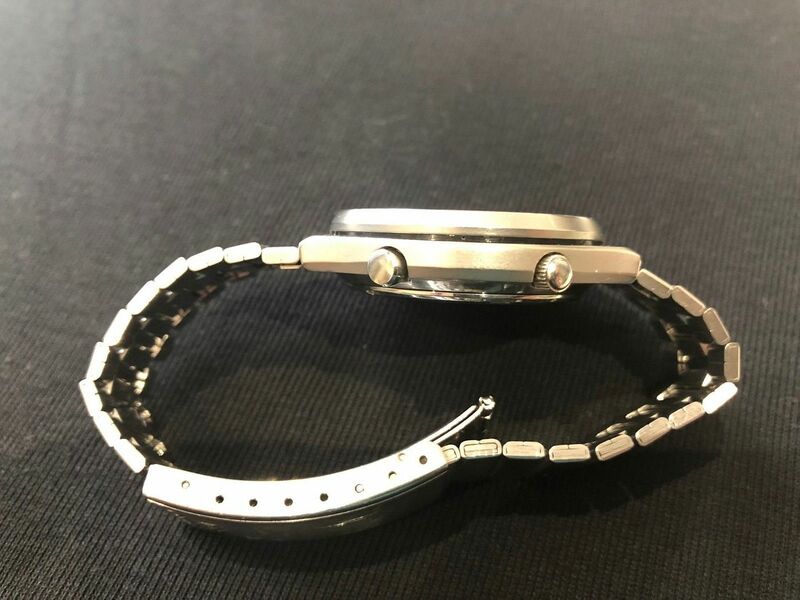 The original bracelet will fit up to a 7 3/4" inch wirst. Excuse my ignorance but what does CONUS stand for. I assume it means they won’t ship outside the US , but this acronym has me beat! Google is your friend, Steve. The contiguous United States or officially the conterminous United States consists of the 48 adjoining U.S. states (plus Washington, D.C.) on the continent of North America. The terms exclude the non-contiguous states of Alaska and Hawaii, and all off-shore insular areas. These differ from the related term continental United States which includes Alaska (also on the North American continent but separated from the 48 states by British Columbia, Canada) but excludes Hawaii and insular territories. Always makes me laugh, when I hear the expression 'World Series'. 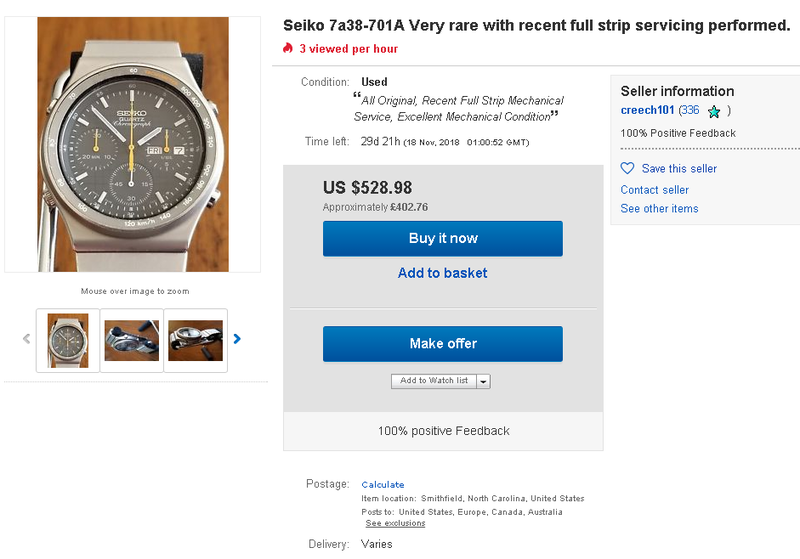 The 5-day US eBay auction for a non-running well-worn 7A38-701A ended in the early hours of this morning, selling for $167.50 ater 23 bids. 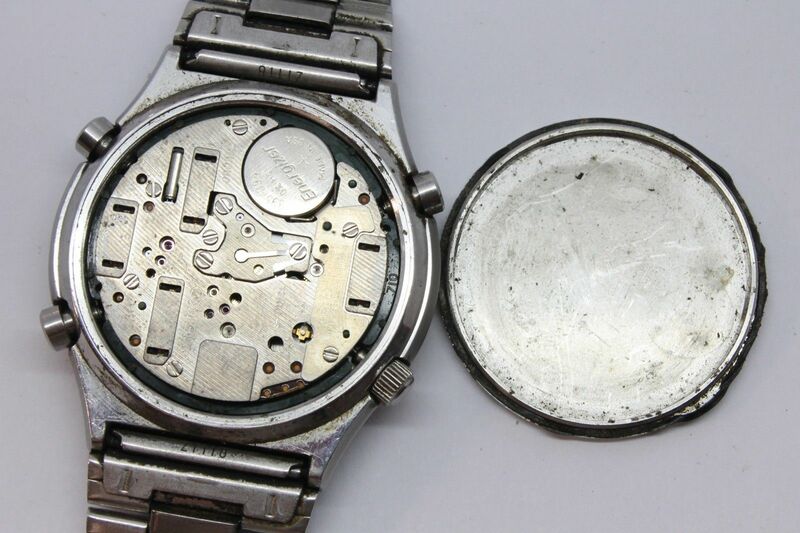 This 7A38-701A, a 'head only' in average worn condition, with stated chronograph pusher fault, was listed this morning, by an Italian eBay seller, as a 7-day auction, with an opening bid price of 35 Euros. Orologio funzionante, il tasto per la partenza del cronografo (alto a destra) non funziona. I restanti pusanti sono a posto e l'azzeramento (dunque il meccanismo del cronografo) è funzionante, semplicemente non è possibile farlo partire. Datario con giorno del mese e della settimana, in lingua inglese e italiana (funzionanti). Oggetto raro e ricercato, il corpo (in acciaio anodizzato in argento) non è mai stato lucidato ed è in condizioni molto buone. Ottimo per completare il 7A38 o, per chi non dovesse aver bisogno del cronografo, per avere l'opportunità di possedere un bellissimo Seiko da collezione. 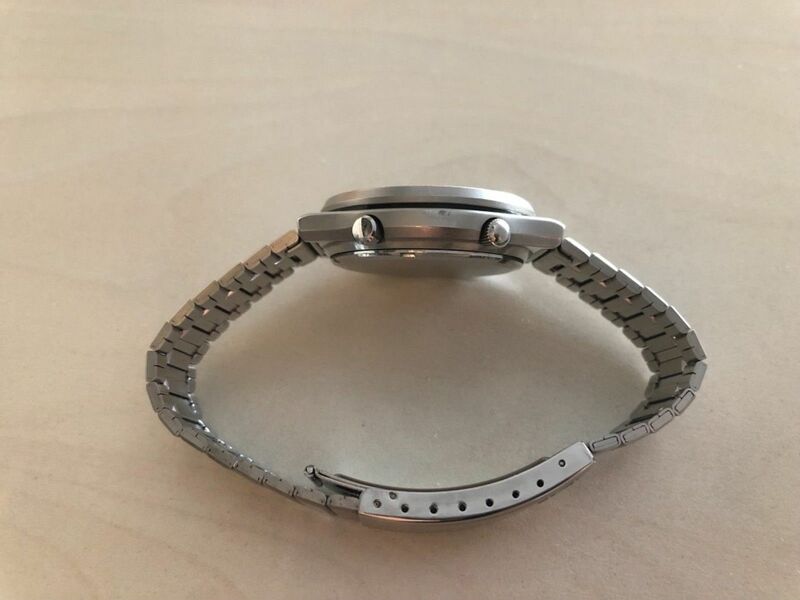 Invio con cinturino in metallo compatibile. Non aggiungo altro, chi lo cerca lo conosce. Buona asta! 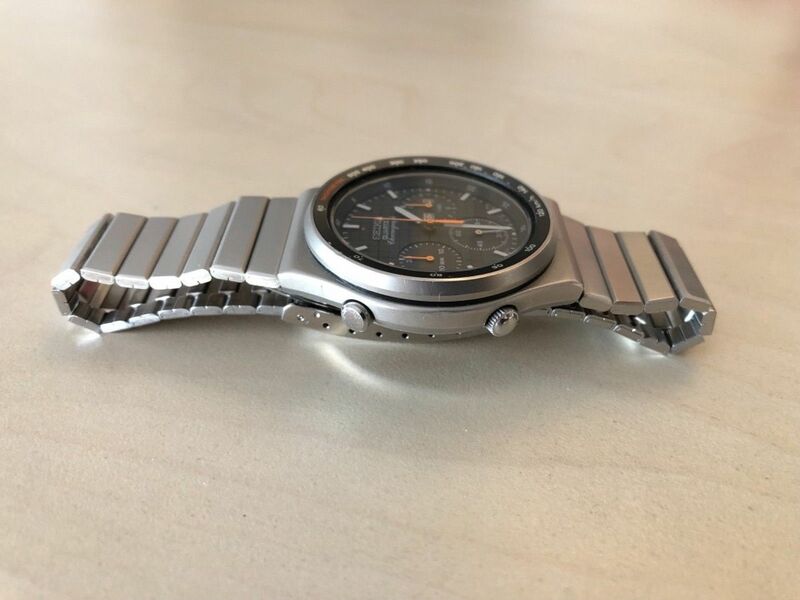 The Italian eBay seller of that 7A38-701A 'Head Only' ended his auction listing early, late yesterday evening, because of an alleged error, cancelling all bids in the process. The high bid at the time was 73 Euros. Presumably sold off eBay, for an undisclosed offer, via the 'back door'. Firstly my apologies to the Italian eBay seller motomattia, for tarring him with the same brush. 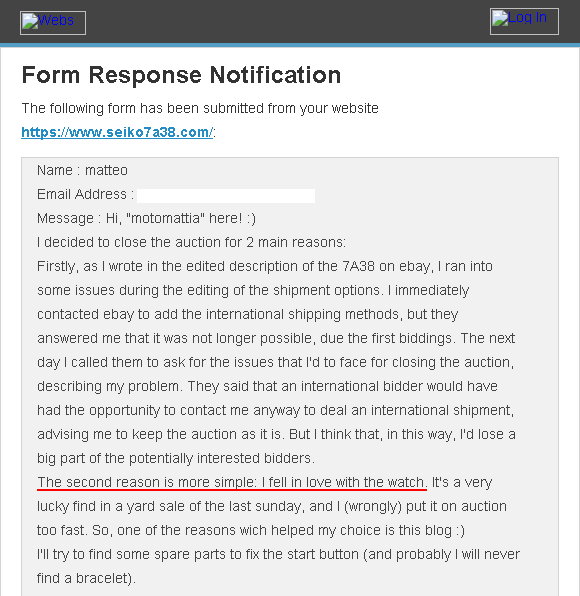 As I wrote to him in a subsequent email reply, when you've seen as many eBay listings ended because of alleged errors, as I have over the years, you tend to become a little cynical and jaded. It transpires that he did genuinely end the listing because of a couple of errors. Later the same day (indeed, not very long after I'd made my previous post) I received this comprehensive explanation through the website contact form. Note the sentence underlined in red. That's as as good a justification for ending a listing as any, in my book. Matteo has since joined the forum. I did give him the opportunity to respond to my previous post, but he politely declined. So I thought I ought to put the record straight. 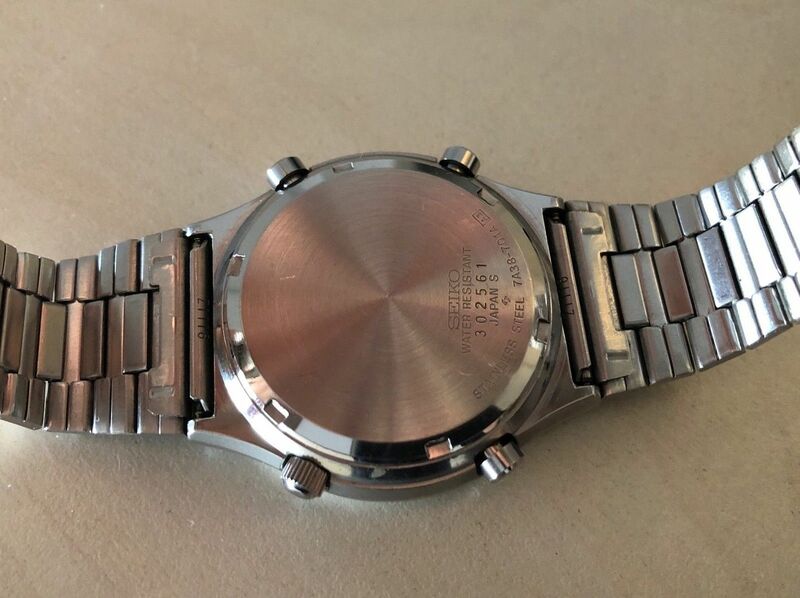 The second update concerns the 7A38-701A offered for sale by US eBay seller / forum member Michael Creech (a.k.a. 'Seacreechur' / creech101). 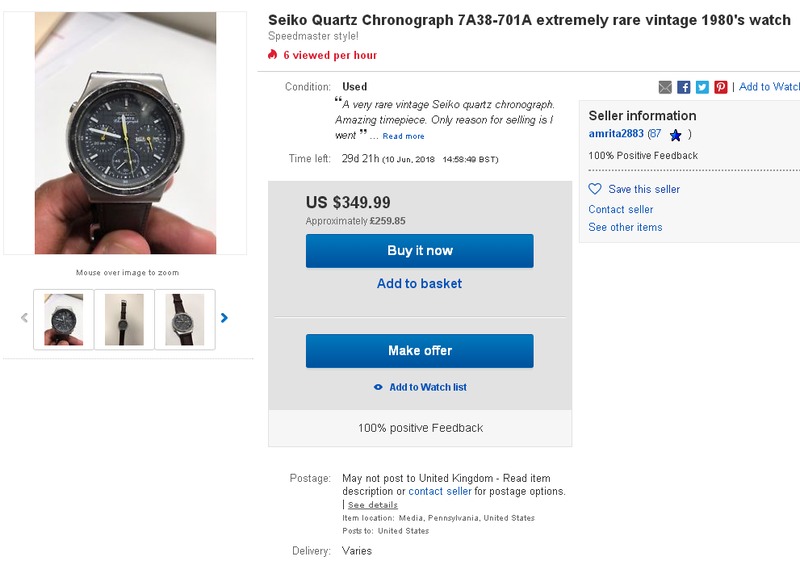 Generally, when a watch has been listed on eBay for 30 days (as a Buy-it-Now) and goes unsold and is subsequently re-listed with a small price reduction, I usually don't bother posting on here about it, to that effect. It's simply a matter of the number of hours in a day (and the number of times this happens). 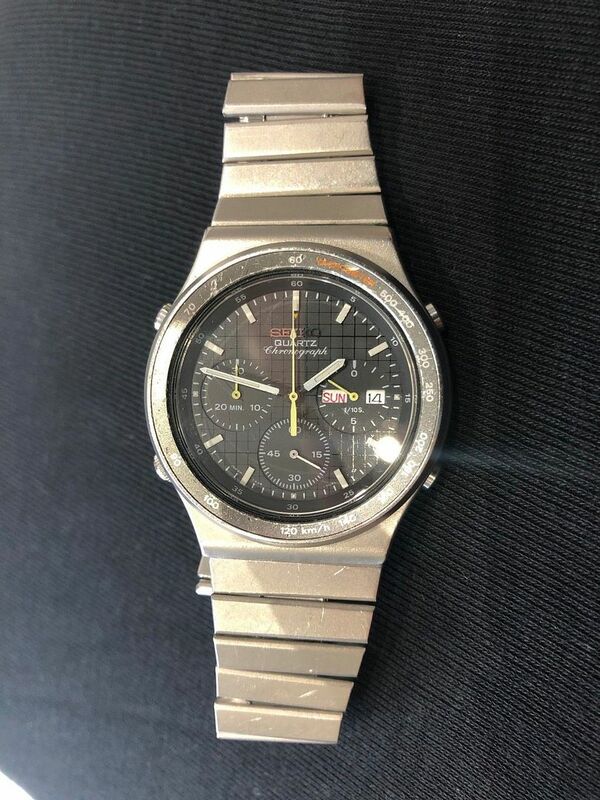 Michael's 7A38-701A did go unsold first time around. He re-listed it a couple of days later, with the Buy-it-Now price reduced by $70 from $598.98 to $528.98. I suppose I should have mentioned it at the time, because there was a more significant difference. In the re-listing he was now offering postage to Australia, Canada, Europe (besides USA). 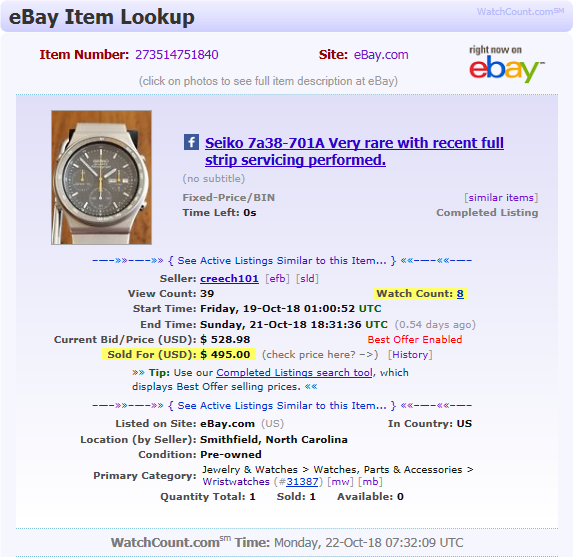 WatchCount.com's Look-up tool reveals it sold for an offer of $495. The eBay Purchase History points to that having been the only offer made. 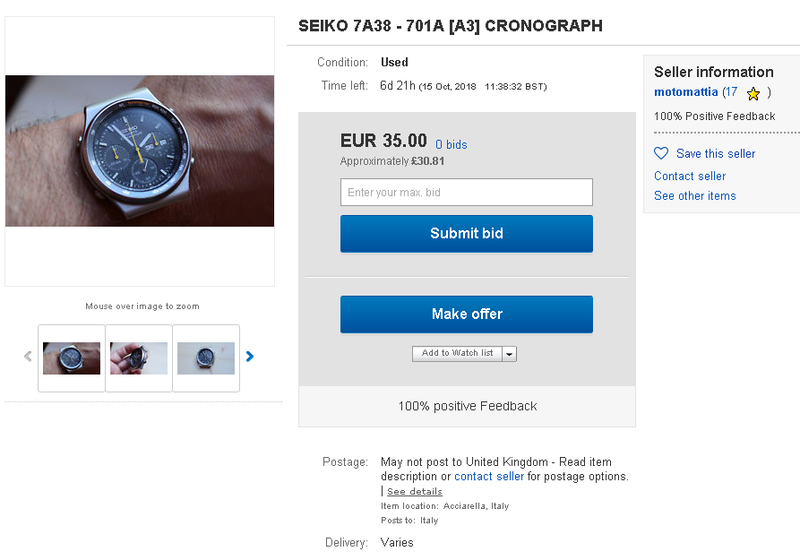 On that note, I suppose I should mention, while I'm updating this thread, that over the course of three 30-day re-listings, the 7A38-701A first listed by Spanish eBay seller iron.rose in July, with an over-optimistic Buy-it-Now price of 420 Euros, has since come down in price, in stages, to a more realistic 300 Euros (still with a 'Make Offer' option). 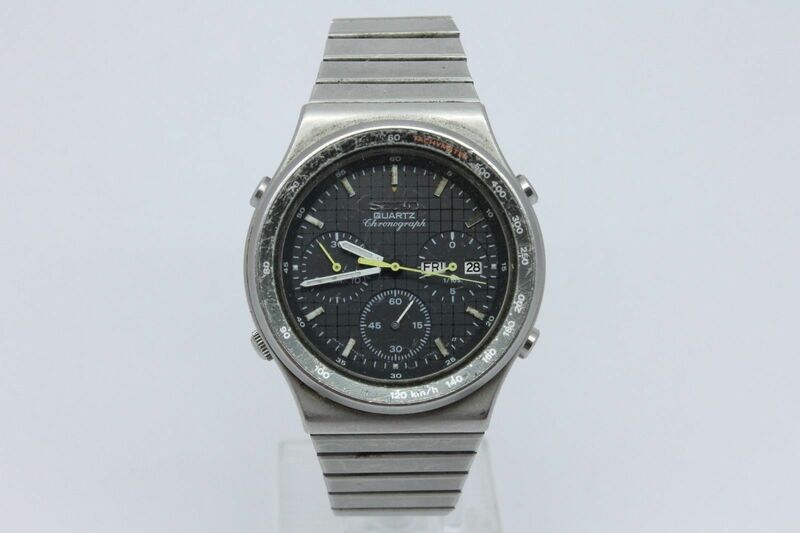 This well-worn 7A38-701A was listed at lunchtime today, by another Spanish eBay seller, as a 7-day auction with an opening bid price of $30. 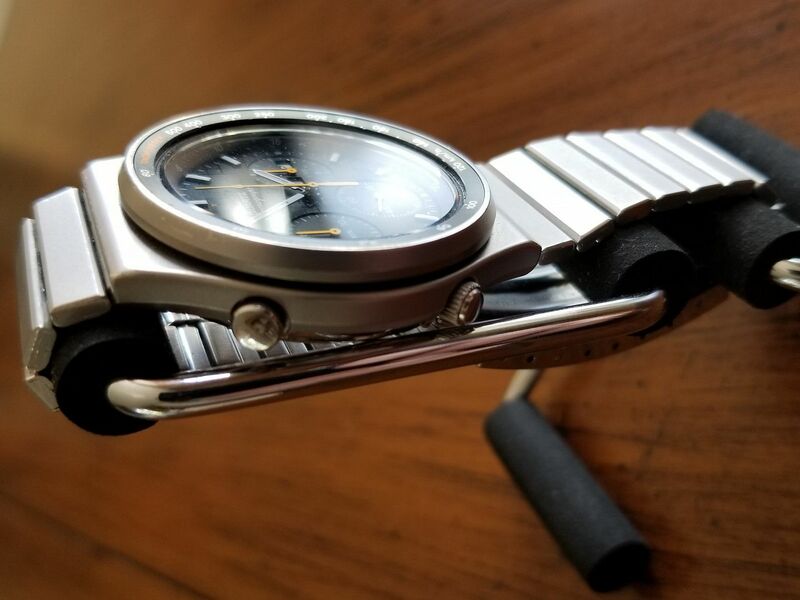 It is fitted with the correct original Seiko p/n Z1118S bracelet, but one that's typically showing evidence of a fair amount of stretch between the links. 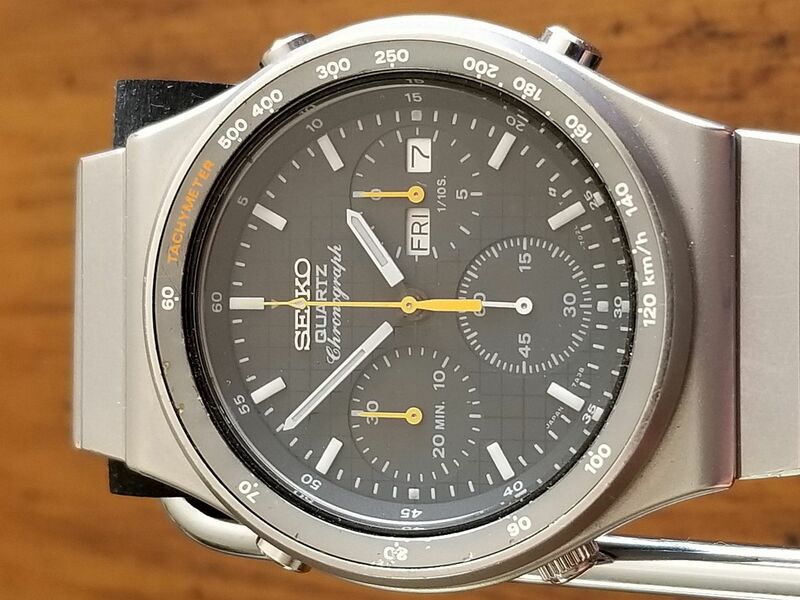 Seiko 7A38-701A also known as - SAA003J. Very rare model. 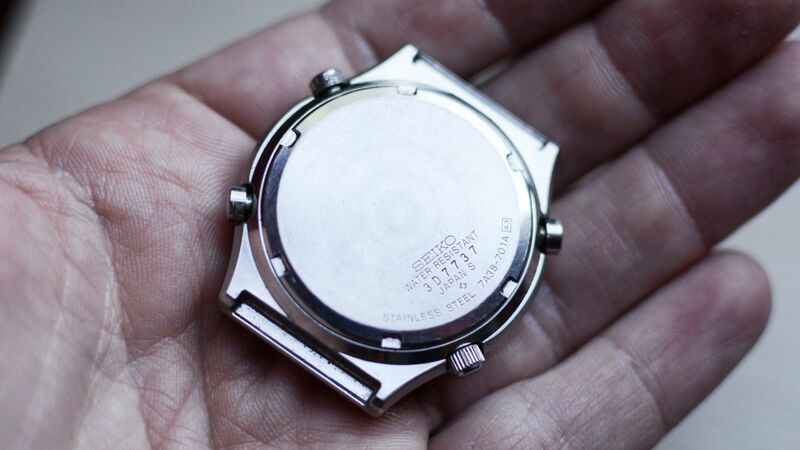 Pushers work, watch works. 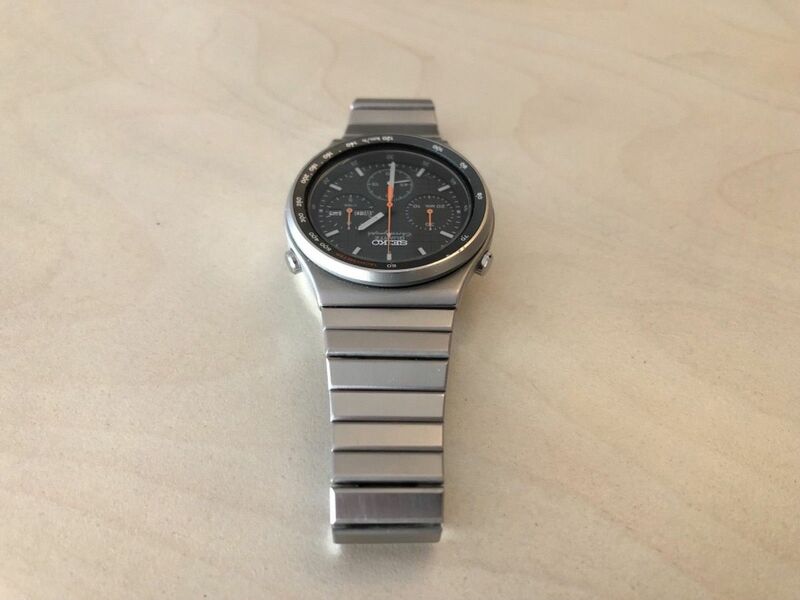 If you are looking at this model you know it is rare to find it in this condition. All original. If you have any questions, please ask. I am selling some of my collection look at my other auctions. Thank you and good luck bidding. 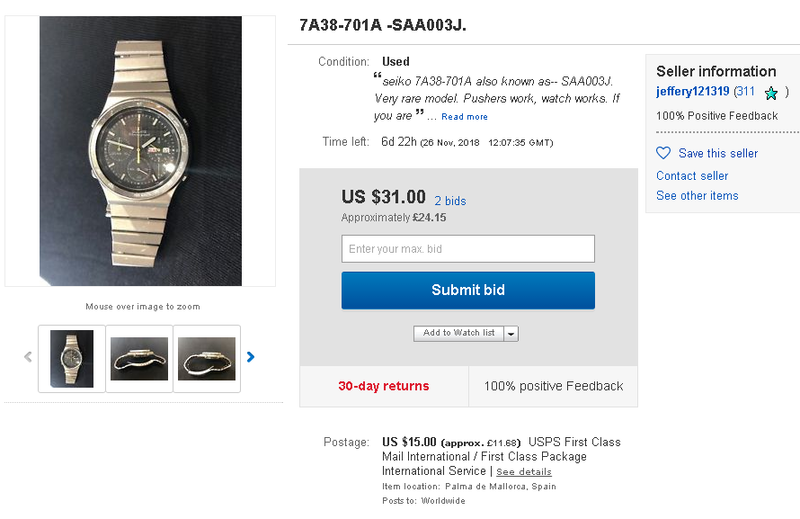 The above 7-day Spanish eBay auction for a well-worn 7A38-701A ended at lunchtime today, selling for $191.50 after 38 bids. 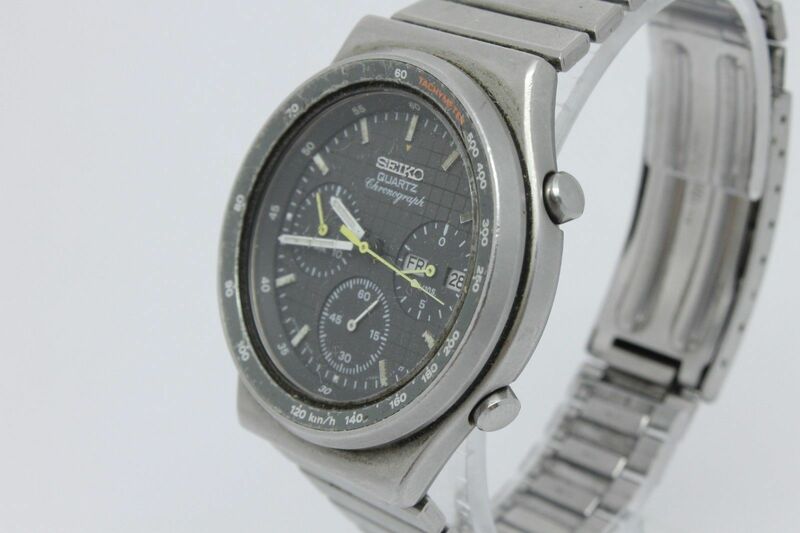 Earlier this afternoon, Italian eBay seller simone00simone listed this 7A38-701A in decent cosmetic condition, as a 10-day auction with an opening bid price of 1 Euro. 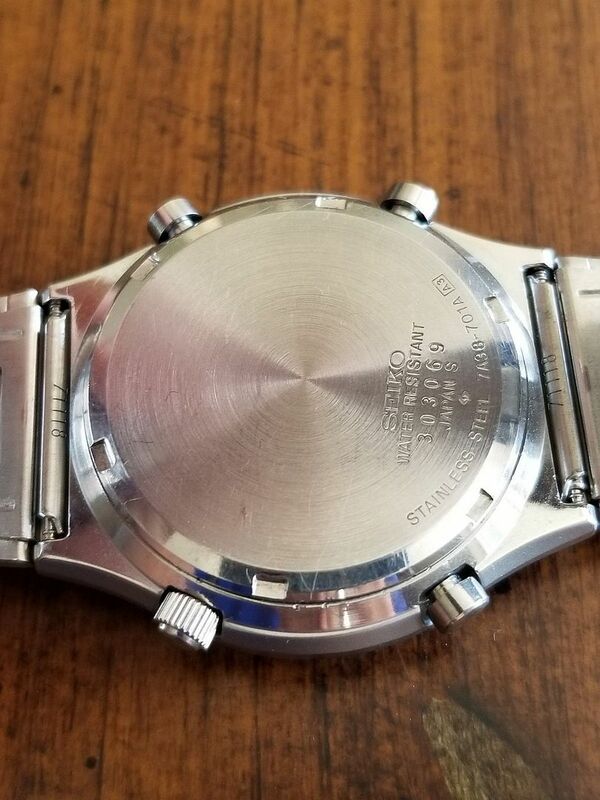 It's only really let down by some small chips in the bezel inlay and what appears to be a shallow ding or graze on the L.H. 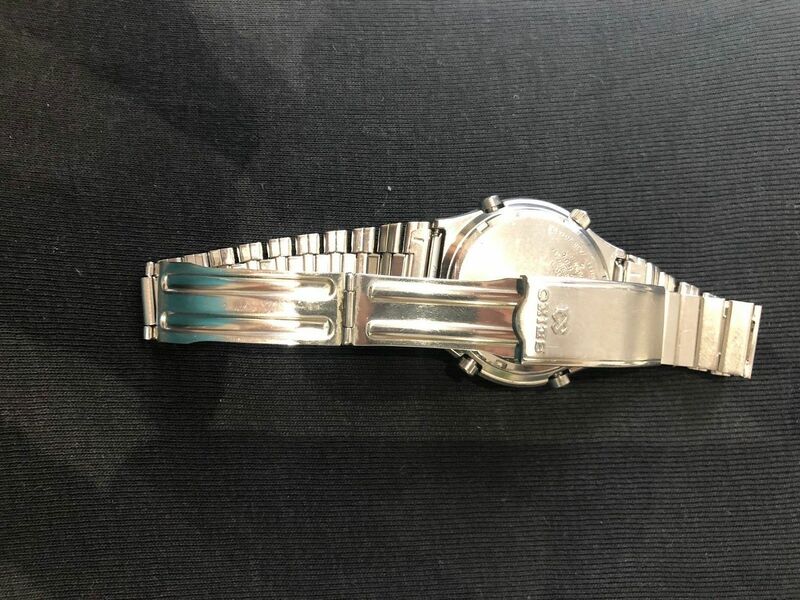 side of the watch case. 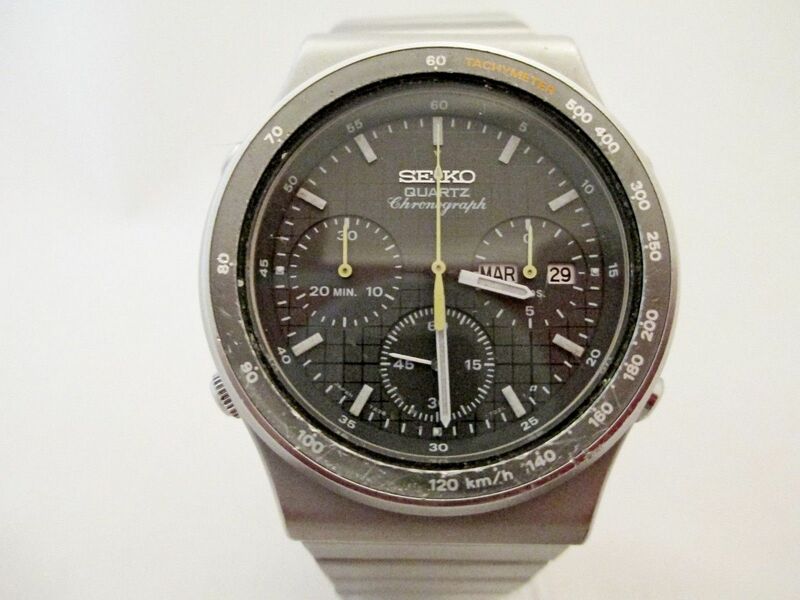 From my private collection I sell this wonderful and very rare Seiko vintage chronograph Quartz 7A38-701A, watch dated 1983 (same year of the release of this form) and in excellent condition both aesthetic and functional, working date change and chronograph parts working, perfect buttons, fully functional and completely original watch. 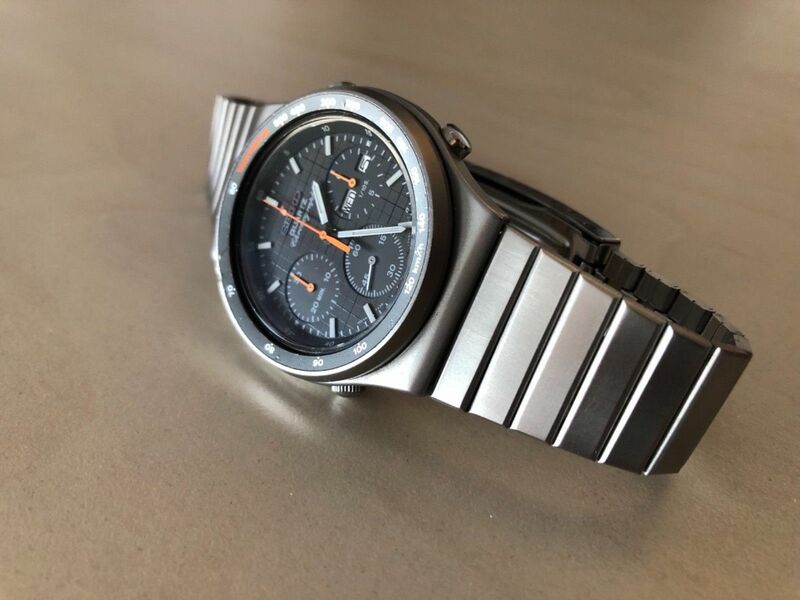 The first quartz chronograph with analogical world display, the module is a quartz is of high quality with all metal bridges, the functions are those classic chronographs with spot and detection of 10th of a second. Contact me for any clarification, return not accepted, I do not sell and I do not ship in Spain and islands Gran Canarias. 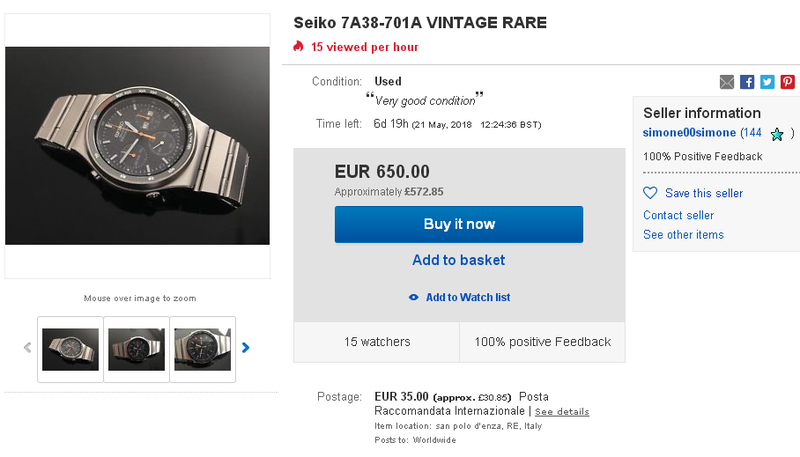 If you'd added that (10-day) Italian eBay auction listing for a 7A38-701A to your eBay watching page, as I did, you'll probably have noticed that it's already been bid to over 500 Euros in less than 6 hours !